En la vida tenemos dos opciones, o escogemos lo que queremos, o dejamos que la vida escoga por nosotros. Si no te decides, no te quejes si la vida escoge algo que no te gusta. In the world we have an advantage, because the truth is that God has given us the world at our feet. We have endless possibilities in the world and the free will to decide what we do with our lives. But with so many options we have, sometimes we get undecided and don’t know which one to choose. In the past, the options we had were less and it was much easier to choose. The more options you have, the harder it is to choose. For example, what is easier? To choose between buying a chocolate ice cream or vanilla? Or choose from the 31 flavors of Baskin-Robbins? That’s why the restaurants that have a small menu are more likely to succeed than one with an extensive menu. Because they can concentrate on honing those few meals and they will have to spend less in the cost of ingredients. This also works in Business Marketing. It is recommended, as I learned in the classes I took of business, to choose a type of ideal client and learn everything about that ideal client, their desires, their doubts, fears, etc. And then market your business to that particular type of people. Especially if you're a small business with little money to invest in marketing. Many people believe that this will decrease your clientele, but the reality is that it will increase the perfect clientele, who will not ask for discounts, and will not come into your store “just looking”. Many people make the mistake of desiring everything. We want to appeal to everyone to our business, and then we complain if the only thing that comes to our shop are people “just looking” and nothing else, people who complain about our prices, that they don’t see the value of our product. People who expect us to lower our prices just to please them, so we end up being affected, for wanting everything and not choosing. But the problem of wanting everything without choosing is not only a business problem, it’s everyone's problem. It is the problem of all those people who spent their money buying things they don’t need just because they can’t decide. People who have lots of clothes still with the tags attached, and boxes and boxes of shoes that they will never wear. And a large number of crap that we buy in "garage sales" things that we'll never use, just because we can, and we believe that one day we will use them. We all go through that; indecision on what should we study, indecision on what career to take, which car to buy, what girl or boy will we choose to get married with, etc. But there is something that not many people understand, and it is that a decision can’t be postponed indefinitely. Although many people have tried and continue trying. When faced with a decision we have to make, it's okay to give it some thought, but you shouldn’t take a long time to make that decision, because if we do, if we think something too much thinking, then without realizing it, time will pass and we will lose the opportunity to choose, because life will choose for us, and we may not like what life chooses for us. If you do not believe me, think about this: If you don’t know what career to choose, you may go to college and take only regular classes without a specialization, but there will be a time when we will reach a point where you'll be ready to graduate, and you never chose anything and wasted your time studying general things and you'll have to take the first job that you can get and you'll end up making a career out of it, that first job you got. Life chooses for you. And in the same way if you can’t choose between two or more people to see who you want to be your partner through life, eventually they will get tired and possibly you will end up with none of them. Life will choose for you. If you do not choose an ideal client in which to focus your marketing in your business, you will attract people of all kinds. Not all of them will value you, they are not all willing to pay what you ask, and your business will not be as successful as it could be. 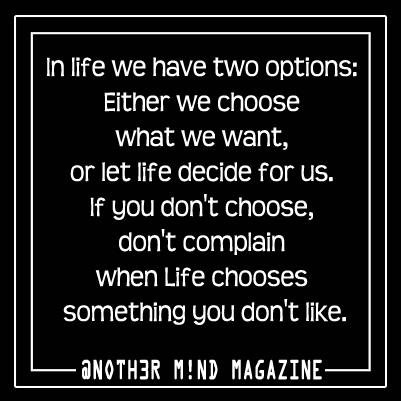 Life is going to choose for you. Realize that life is not thinking about what's best for you. Life is simply choosing a decision out of a hat and whatever comes out, comes out. So please think. What decisions have you been postponing? Don’t let life randomly pick for you. You'll have a better chance of success if you pick yourself. So, what happens if you choose the wrong thing? It's easy, you change your mind and change your decision. Each change of mind and change of selection is a fresh start, and that’s why so many people are hesitant to choose something from the start. But think of it this way. If you choose wrongly you'll realize it fairly quickly and you can change it. When life chooses for you, many times it’s been so long since you decided to postpone your decision that starting again will result in a lot of lost and wasted time. When we make our own decisions and those decisions turn out to be mistakes then it is much easier to rectify that mistake, because we are aware of what we decided and what our alternatives where and still are. When life chooses for us, it usually takes us by surprise, making it harder to rectify and many times we won’t even know what options we have left. Do you choose yourself how you want your life to go, or would you rather let life choose for you? Keep in mind that either way we always have more opportunities, yet it is better to change your mind and decision quickly, than to kept waiting, thinking that you don’t want to feel that you have wasted many years on something. Because six years wasted on something is way better than wasting 10 years on something. One last thing, time is NOT wasted when you don’t know you're wrong, time is ONLY wasted when you know you have to change something and you keep trying to make it work even though you know that it no longer works. Has Life ever chosen things for you? Decídete O La Vida Decidirá Por Ti En el mundo tenemos una ventaja, porque la verdad es que Dios nos ha puesto el mundo a nuestros pies. Tenemos infinidad de posibilidades en el mundo y el libre albedrío de decidir lo que queremos hacer con nuestras vidas. Pero con tantas opciones que tenemos, muchas veces nos ponemos indecisos y no sabemos que escoger. En el pasado las opciones eran menos y era mucho más fácil elegir. Mientras más opciones tengamos, más difícil es escoger. Por ejemplo, ¿qué es más fácil? ¿Escoger entre comprar un helado de chocolate o uno de vainilla? ¿O escoger entre los 31 sabores de Baskin-Robbins? Por eso los Restaurantes que tienen un menú pequeño tienen más probabilidad de éxito que uno con un menú extensivo. Ya que se pueden concentrar en perfeccionar esas pocas comidas y van a tener menos costo de ingredientes. También esto funciona en Mercadeo para Negocios. Es recomendable, según las clases que he cogido de negocio, el escoger un tipo de cliente ideal. Saber todo a cerca de ese cliente ideal, sus deseos, sus dudas, sus miedos, etc. Y mercadear tu negocio a ese tipo particular de personas. Especialmente si eres un negocio pequeño con poco dinero para invertir en mercadeo. Mucha gente se cree que esto va a disminuir su clientela, pero la realidad es que va a aumentar la clientela ideal, la que no te va a pedir por descuentos, la que no va a entrar en tu tienda a mirar solamente. Muchos cometemos el error de desearlo todo. Queremos atraer a todo el mundo a nuestro negocio. Y después nos quejamos si lo único que llega a nuestra tienda son personas mirando y nada más, personas que se quejan de nuestros precios, que no ven el valor de nuestro producto. Que quieren que nos rebajemos para complacerlos. Y nosotros terminamos siendo los afectados, por quererlo todo y no escoger. Pero el problema de quererlo todo sin escoger no es solo problema de negocios, es un problema de todos. Es problema de todos aquellos que nos pasamos comprando cosas que no necesitamos solo por no podernos decidir. Personas que tienen cantidades de ropa todavía con sus etiquetas sin quitar, cajas y cajas de zapatos que nunca nos vamos a poner. Sin número de porquerías que compramos en los “garage sale”, cosas que nunca vamos a usar, simplemente porque podemos, y creemos que un día los vamos a usar. Todos pasamos por eso, indecisión en lo que vamos a estudiar, indecisión en qué carrera tomar, que carro comprar, que chica/o vamos a escoger para casarnos, etc. Pero hay algo que no muchas personas entienden. Y es que una decisión no se puede posponer indefinidamente. Aunque muchas personas lo han tratado y siguen tratándolo. Cuando nos enfrentamos con una decisión que tenemos que tomar, está bien pensarlo un poco, pero no tomarse mucho tiempo en tomar esa decisión, porque si lo hacemos, si nos tomamos demasiado tiempo pensando, entonces sin darnos cuenta, vamos a perder la oportunidad de escoger, ya que la vida va a escoger por nosotros y puede que no nos guste su selección. Si no me creen, piensen esto: Si no sabemos qué carrera escoger para ir a la universidad y nos ponemos a coger clases generales sin especialización, va a llegar un punto en que vas a estar a punto de graduarte, nunca escogiste nada, y desperdiciaste tu tiempo estudiando cosas generales y vas a tener que coger el primer trabajo que puedas conseguir y vas a terminar haciendo una carrera de eso que fue lo primero que conseguiste. La vida escoge por ti. Y de esa misma manera en todo. Si no puedes escoger entre dos o más personas para ver quien quieres que sea tu pareja, eventualmente las personas se van a cansar y posiblemente te quedes sin ninguna. La vida escoge por ti. Si no escoges un cliente ideal en el cual enfocar tu mercadeo en tu negocio, vas a atraer personas de todo tipo, que no todas te valoren, que no estén dispuestos a pagar lo que pides, y tu negocio no va a ser tan exitoso como pudiera ser. La vida va a escoger por ti. Piensa que la vida no está pensando en lo mejor para ti. La vida simplemente escoge un papel de un sombrero y lo que salga, eso es lo que salió. Así que ponte a pensar. ¿Qué cosas estás posponiendo para tomar una decisión en ellas? No dejes que la vida escoja al azar por ti. Obtendrás una mejor oportunidad de éxito si escoges tú mismo. ¿Y qué pasa si escoges la cosa equivocada? Es fácil, cambias de opinión y cambias tu selección. Cada cambio de opinión y cambio de selección es un empezar de nuevo. Y por eso muchas personas se frenan en escoger desde un principio. Pero piénsalo de esta manera. Si escoges mal te vas a dar cuenta de una vez y vas a poder cambiar. Cuando la vida escoge por ti, muchas veces ha pasado tanto tiempo que el empezar nuevamente será resultado de mucho tiempo perdido y desperdiciado. Cuando cometemos errores en momentos en que hemos tomado decisiones pensadas, es mucho más fácil rectificar, porque estamos conscientes de lo que decidimos y las alternativas. Cuando la vida escoge por nosotros las selecciones nos toman por sorpresa. ¿Entonces que prefieres? ¿Escoger tú mismo o dejar que la vida escoja por ti? Pero igualmente, siempre tenemos más oportunidades, es mejor cambiar de opinión y decisión rápidamente, que quedarse esperando, pensando en que no quieren sentir que han desperdiciado muchas veces años en algo. Pero desperdiciar 6 años en algo es mejor que desperdiciar 10 años en algo. Y otra cosa, el tiempo no es desperdiciado mientras no sabes que estás equivocado, el tiempo se desperdicia cuando sabes que tienes que cambiar algo y tratas de hacerlo funcionar aun sabiendo que ya no funciona. ¿Tienes ejemplos de momentos en las cuales la vida ha escogido por ti?